The Aruba Marriott Surf Club is located on beautiful Palm beach. It offers deluxe rooms and spacious one, two, and three bedroom villas. It features separate living and dining areas complete with ocean views and private balconies. It has 14 floors, 450 rooms, 450 suites. Featuring spacious accommodations for couples and families alike. This resort has a luxurious outdoor pool with a lazy river and whirlpool. The Surf Club has a video game room, shops, vending machines, picnic areas with barbecue grills, car rental desk, ATM cash machine, coin operated laundry facility, housekeeping daily, and a concierge desk. There is a Fitness facility and a variety of restaurants and lounges. 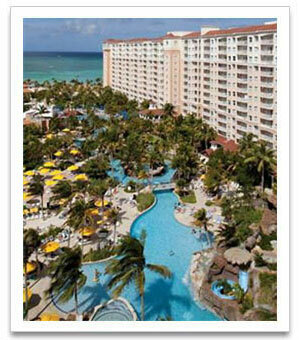 The Aruba Marriott Surf Club has fully air conditioned deluxe guest rooms, and one, two, and three bedroom villas. The villas have separate living and dining room areas, plus fully equipped kitchens. The kitchens have a microwave, stove, dishwasher, refrigerator and all pots, dishes and utensils. Master suites have king beds, deep soaking tubs and separate showers. Satellite TV programming and DVD player provide in room entertainment. Two bedroom, two bath villas sleep 8 people. Three bedroom, three bath villas sleep 12 people.